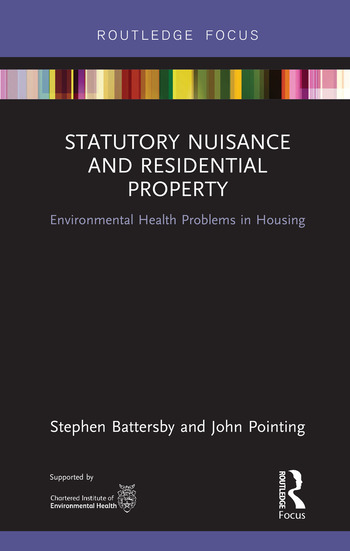 Statutory Nuisance and Residential Property: Environmental Health Problems in Housing examines the statutory nuisance provisions in the Environmental Protection Act 1990 pertaining to the condition of premises and related problems in housing and compares these with the provisions of the Housing Act 2004. The book discusses the separate development of statutory nuisance and housing legislation in an historic context, which provides a useful basis for the understanding and interpretation of legislation and the different remedies available today. The work includes a chapter on actions by “persons aggrieved” using section 82 of the Environmental Protection Act 1990 and also considers remedies provided in the Anti-social Behaviour, Crime and Policing Act 2014. • demonstrates how to use the legal framework appropriately and be able to decide on the most appropriate provision for dealing with environmental health problems associated with residential property. This is an essential and practical book for environmental health and housing professionals, as well as for advisers and lawyers in the private and public housing sectors. What is meant by statutory nuisance? Dr Stephen Battersby is a freelance environmental health and housing consultant and fellow of the CIEH and RSPH. He is a past president of the CIEH and currently vice president. He has chaired the Pro Housing Alliance. ARCHIVE UK (Architecture for Health in Vulnerable Environments) and Generation Rent (the National Tenants Organisation). Currently he chairs the Committee of Management of the National Code of Standards for larger student developments. His research interests include housing conditions and health (housing as a social determinant of health); the use and enforcement of legislation to secure healthful housing; and urban rodent infestations and public health. He is also the current Editor of Clay’s Handbook of Environmental Health – the standard environmental health textbook. In 2014 he was awarded an MBE in the Birthday Honours List for services to Environmental Health. John Pointing is a barrister practising in environmental health law. His practice includes advising and representing local authorities, central government, commercial clients and private individuals. He is the Legal Partner of Statutory Nuisance Solutions, a firm he set up with David Horrocks in 2010. Since 1992, he has run courses for the Chartered Institute of Environmental Health and for local authorities on a wide range of issues, including statutory nuisance, food safety and health and safety. From 2003 to 2013 he was a senior lecturer in law at Kingston University. He is a visiting lecturer at several universities and an external examiner at De Montfort University for environmental law and food law. He is co-author (with Rosalind Malcolm) of the leading text on statutory nuisance law: Statutory Nuisance Law and Practice, 2nd ed., 2011 and Food Safety Enforcement, 2005. Since 2003 he has been interested in issues affecting the Muslim community, particularly those to do with fake Halal and food crime.